I don't know about you...but I always tend to avoid paying a lot of money for trendy pieces that I will probably only wear for one season. 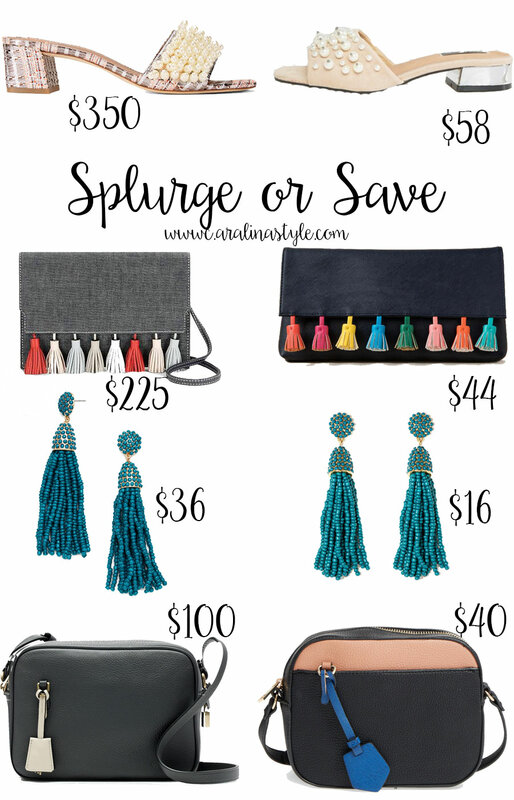 As much as I love a good tassel earring, I don't always want to pay full price for them. I also really love to buy things in multiple colors, and that is always easier if you can find a cheaper alternative (like these earrings that come in 17 different colors). So here are some affordable look-a-likes of some popular accessories for summer! Also, as I've mentioned in my last two posts: Shop with me at Fab'rik this Saturday from 2-4pm in Birkdale Village (Huntersville, NC) for your upcoming vacations! You can also enter to win a piece from the store and I can help you style it! I love the tassel clutch. All the colors on it are amazing. I've always loved these dupes posts! I'll have to check these out. Thanks for sharing!